At Hoggatt Law Office, P.C., we provide responsible, aggressive representation for victims in a wide range of personal injury and workers' compensation matters. With more than 20 years of legal experience, our skilled attorneys understand how to work within the law to help you obtain the compensation you need. From the moment you contact us, you will be able to feel the difference that working with a small firm makes. We become personally invested in each case that we take on, and you become part of our family. To us, you will always be more than just the name on a case file. You are a real person with real problems, and you deserve real justice. By taking the time to get to know you and your family, we are able to see how your injury is affecting your life and what you will need to make things right. From there, we will negotiate with insurance companies and other parties on your behalf in pursuit of just compensation. If a settlement is not possible, we are not afraid to take your case into the courtroom. Our approach has helped us recover millions of dollars in verdicts and settlements for our clients, and we are ready to go to work for you. Our team will work hard to identify the party or parties responsible for your accident and to hold them accountable to the full extent of the law. If you have been hurt in any type of motor vehicle accident, call us first. Our attorneys understand the challenges you may be facing in obtaining the benefits you need and getting back to work. We will do everything we can to help you and family put your lives back on track. If you have suffered an injury at work or in a motor vehicle accident, contact our office. 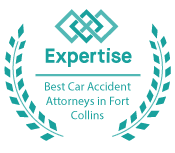 Call 970-460-2220 or 1-800-664-3151 to schedule your free initial consultation today. We serve clients in Greeley and throughout Weld County and the surrounding areas.